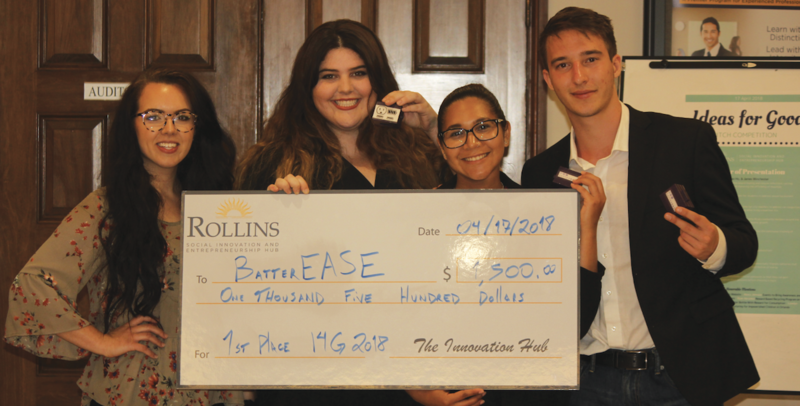 This Rollins team, BatterEASE, is one of only 50 selected to compete in an accelerator program in London next August. Out of those, six will be picked to pitch to the U.N. and then only one will get the $1 million in seed funding. BatterEASE’s product is a battery that is Effective, Accessible, Sustainable, and Environmentally friendly. The team consists of Kinsley Gerks ‘20, Nikki Hall-Elser ‘18, Dayra Diaz-Marquez ‘18, and Matias Meirelles van Vliet ‘19.